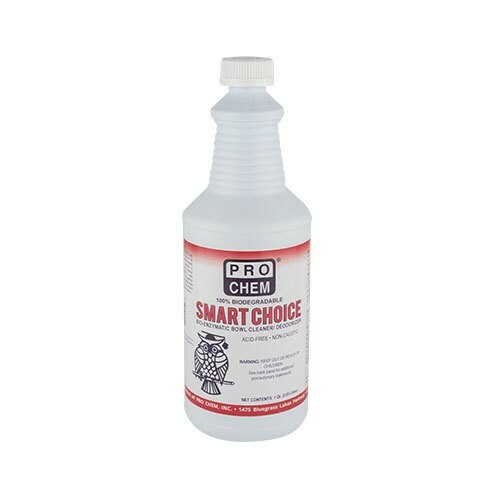 Smart Choice | Pro Chem, Inc.
SMART CHOICE is a bioenzymatic bowl cleaner and digester that is used to help digest and degrade waste and eliminate odors caused by urine and other biological waste. It can be used to clean most surfaces in a restroom, including the floor, walls, and dividers between stalls. The specialized bacteria break down the urine completely, eliminating the source of the odors. Daily use down urinals, toilets, sinks, and shower drains help keep pipes clear and free from grease, fats, and other solid materials. SMART CHOICE is an excellent drain maintainer that eliminates the need for hazardous chemicals such as acid, caustic, and bleach. Use daily as a cleaner and odor eliminator. See complete directions on product label.